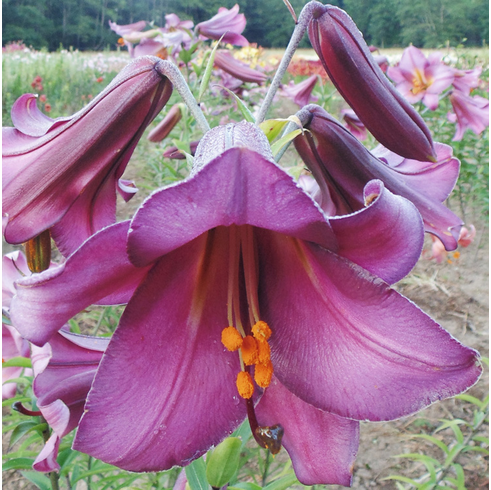 This improved strain includes light to deep pink to purple-black funnel-shaped flowers up to 10 or 12 inches long. Very hardy and disease-resistant, 'Pink Perfection' bulbs can be happy for years without division if provided regular feeding and weeding. These are grown from seed produced from the old, original DeGraff stock; color will vary from light to dark. The size of flowers and the height of the stem may also be different from bulb to bulb. Always short the first year planted, but stake in later years. Average 5 to 6 feet at maturity, but we've seen old specimen plants that were eight feet tall. July Flowering. Highly Fragrant.